Fike and Harris’ video installation, Food Fight, is the best bad boy, art world, conceptual antics that I’ve seen since stumbling on a screening of Paul McCarthy’s 1974, performance of Hot Dog. Unlike McCarthy’s work that relies on elements of disgust and sexual perversion to mock American life; Fike and Harris use boredom and disinterest to a similar effect. Walking into the darkened gallery where two large white walls, built for the private performance, sit facing each other; viewers line up between to watch Fike and Harris methodically hurl food at each other. Harris in his grey t-shirt in a white, sterile contemporary kitchen is oppositional to Fike’s traditional kitchen with its easygoing, warm and inviting color on the walls. For twenty minutes Matt Harris neatly and calmly prepares spaghetti with fresh herbs, deluxe sandwiches with French’s yellow mustard, chocolate cupcakes with candy pink frosting and barely registers any notice or emotion as Fike’s quickly prepared pizza, angel food cake, Jell-O, and bean burritos splatter, bounce, and ricochet around him. Where Fike had to work hard to splotch up Harris’ minimalist space, Harris is able to mark up Fike’s body and space easily. 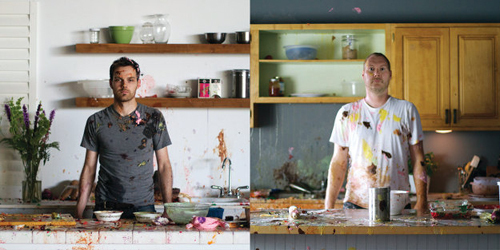 Fike’s traditional kitchen is rendered like an allover composition, a Pollock painting, with pink, yellow and chocolate marking his white t-shirt with drips and globs. The artists fabricated two kitchens that mimic design ads whose spaces could have been lifted out of pages from Architectural Digest or Better Homes and Gardens. Perhaps Fike and Harris each acted out the part of the silent kitchen helpers from a cooking channel show? Are they the Hell’s Kitchen sous chefs who’ve silently run amok? Using antics one might see on reruns of Lucille Ball or Laurel and Hardy but without the overemphasized facial expressions routinely used in slapstick comedy; Food Fight is both frenetic AND cool. It’s a high fashion ad where models maintain ridiculous poses and an uncompromised exterior. Harris and Fike poke fun at the art of LOOKING GOOD even while performing 10 functions at once. The video installation, Food Fight, is up at Vertigo Art Space through October 26, 2013. Visit with the artists and owner Kara Duncan at the closing reception, Friday, 25 October 2013, 6–9 pm. VERTIGO Art Space is located in Denver’s Art District on Santa Fe, with easy parking and numerous galleries and restaurants nearby. Always open for the well-known First Friday and Third Friday art walks from 6 to 9 pm.